IPhone apps seem to get all the attention these days, which is why we wanted to do a post talking about some of the fun Google apps that might be of use to travelers on the road. Hey, it’s only fair, right? Not everyone will have an iPhone, but we all want travel help and guidance in a form that fits in our pockets. Just like the name suggests, Google Voice Search lets you search the Web using your voice commands. How it works: You select the Google Mobile App on your phone, wait to hear the beep and then say the phrase you would like to search for as you would type it in Google. This application also recognizes your current location to give you localized results. Why it’s good for travel: Do you ever end up with your hands full, trying to juggle several items as your moving from place to place? Fumbling around on your phone, in cases like this, as you type in a search for a hostel near Grand Central Station can take a bit of effort. With Voice Search, however, you don’t even have to touch the keypad. Simply put the phone to your ear and say “hostels near Grand Central Station”. That means one hand can be pulling luggage while the other hand is dealing with your phone. It’s a win in so many situations, and it saves time as well. 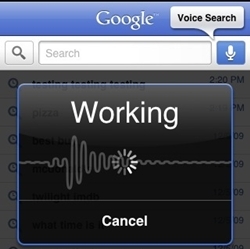 The Voice Actions app lets you control the functions of your phone by using voice commands. How it works: There are certain phrases that help to activate the functions of your phone, such as “send text to” followed by the name of the contact and your message. Why it’s good for travel: Overall, it makes the operation of your phone hands-free. So, if you happen to be driving, or need to do something quick, then Voice Actions can help. 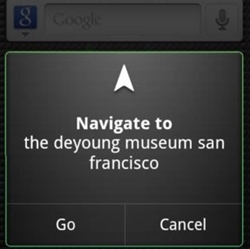 My favorite is the option to open driving directions by using the command “navigate to” followed by the destination. The phone is turned into an instant GPS without the need to fiddle around with buttons when you might already be on the road. If you love Google Maps on your computer, then having it on your phone is even better. It offers driving, biking, walking and public transport instructions on your phone. 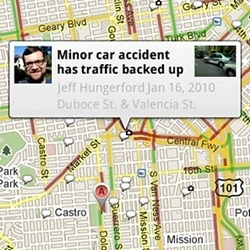 How it works: The features of the Google Maps application use an internet connection and GPS in order to provide directions, as well as places in the vicinity. Why it’s good for travel: The app has various functions that can help you navigate through a city, which is fantastic for those times when you get lost just trying to find your accommodation (hey, we’ve all been there). With the navigate option, you can get directions read back to you so you don’t have to worry about using your hands with your phone when driving. The My Location feature helps you find where you are currently located on a map, and the Places feature will use this information to provide nearby restaurants and shops. 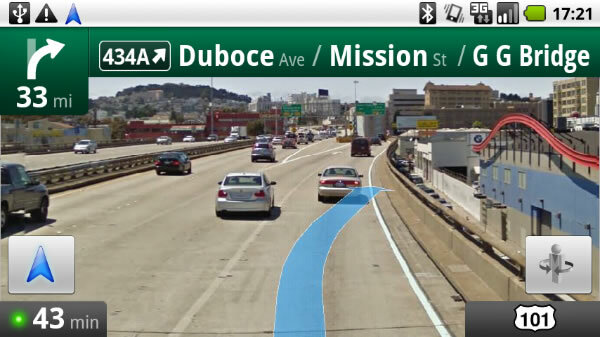 By far one of the coolest Google apps, Google Goggles lets you search the Web using pictures. Find out the history of a landmark or piece of artwork, store contact details, or even translate text. There’s also the option to scan bar codes to find out where a product is sold, and the logos option helps you to find out more on a company just from their image. 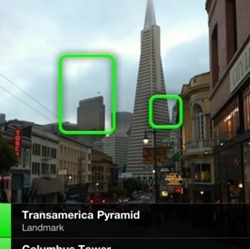 How it works: This app uses visual search. You simply photograph a landmark, wine label, logo, foreign text or bar code using your phone to be returned with results. 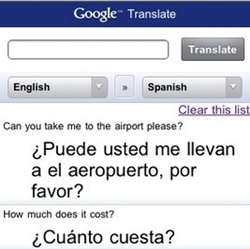 Why it’s good for travel: The text translation aspect is reason enough to get this app on your phone! No more sitting at the restaurant in Paris trying to figure out what’s on the menu. Simply snap a shot of the text and Goggles will translate it into something you will understand. As of now, Goggles can read English, French, Italian, German and Spanish, but translations occur into many more languages. Beyond text translation, the recognition of landmarks and artwork is a treat when gallivanting in foreign cities. Instead of saying, “Oh, I wonder what that statue is all about,” you can just snap a photo and let Google Goggles do the rest. Too easy! Google Translate takes the cake by being able to recognize your spoken word and translating it into another language (out-loud nonetheless). How it works: Instead of needing to photograph text, you can simply say a word in your language to hear a spoken result of the translation. Just select the audio for the language you want to hear. Why it’s good for travel: This is a no-brainer. While gestures and charades may get you through the majority of your travels, there is probably one time or another where needing a specific word can be of great use. The ability to receive it in a spoken manner means you also don’t have to attempt a difficult pronunciation, which can mean the difference between one word and another in some languages. The benefits of these Google apps for travelers are easy to see, and you might be wondering just how to go about getting them on your phone. First off, you need to have a Google apps enabled phone. 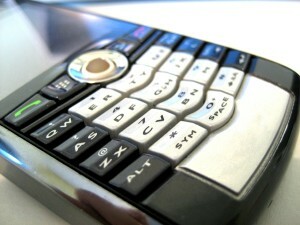 There are several on the market as of now including Androids, iPhones, Blackberries, Nokia S60s and Windows phones. If you’re not sure if your phone will work with the apps, then just navigate to the Google Mobile Apps page and send a link to your phone. Once you have a Google apps enabled phone, downloading the apps above can be as easy as navigating to m.google.com (on your phone) or accessing the Google Mobile Apps page and sending the link directly to your phone. If you own an iPhone, downloading the apps from iTunes may be necessary. Overall, it is a simple process that will take just a few minutes to complete and pay off heaps on the road. Someone essentially lend a hand to make critically posts I might state. This is the very first time I frequented your website page and to this point? I surprised with the research you made to make this actual publish amazing. Wonderful task! Hi there, You’ve done a great job. I?ll certainly digg it and in my opinion recommend to my friends. I am confident they will be benefited from this site. you should also mention that google will store any data you send it, including pictures, location services, and even your voice. Please make note that by using these services you give up your rights to this data. Woah this particular blog site is amazing everyone loves looking at your site content. Carry on the good work! You already know, plenty of individuals are searching circular for this details, you can assist them to enormously. We’ll right away seize a person’s rss feed because i cannot find your own e-mail request hyperlink or perhaps newsletter assistance. Complete you could have just about any? Generously permit myself know in order that I could sign up to. Thanks a lot. You are aware of consequently considerably on the subject of the following issue, produced everyone for me think about it at a number of a variety of perspectives. It has the such as men and women aren’t involved until it is think about complete along with Pixie lott! Your individual stuffs excellent. Everyday take care of it down!